President Emmerson Mnangagwa’s election victory in the July 30 election has left thousands of people distressed in Marondera as they had expected MDC Alliance leader Nelson Chamisa to upstage the ruling party’s candidate. It was business as usual in Marondera Central yesterday, with people saying that they had no hope that Mnangagwa will turn around the faltering economy. The MDC Alliance won resoundingly in Marondera in the local government and parliamentary vote. The residents of Marondera’s excitement, however, turned into mourning as Chamisa lost to his Zanu PF rival in the presidential run. 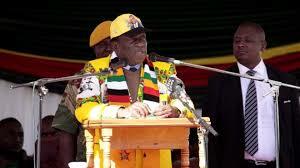 Yesterday, a number of people who spoke to NewsDay said the future was bleak as they now had to endure another five years of suffering under the Zanu PF leadership. MDC-T Chamisa faction’s Marondera chairperson, Chengetai Murowa, said people were now frustrated and hopeless. “The people are disappointed, frustrated and have no hope for the future. We need economic solutions, but not with this government,” he said. Peter Taruvinga (24) of Cherima suburb said he has lost hope of a decent living, given Zanu PF’s failure to fix the economy in the previous years. “I was expecting a Chamisa win and he is the man I thought would take the country’s economy forward. I need a decent life and I am not convinced that the Zanu PF government will do us a favour, given their past failures,” he said. A number of vendors who spoke to NewsDay said they would continue with their operations and hoped that things would get better. “I have been voting for change, but it seems it’s not coming. I have moved on and my prayer is that the new government does its best to solve the economy. For now it’s the same story, hustling on the streets,” Moreblessing Mudzamiri, a vendor along Pine Street, said. Meanwhile, MDC Alliance’s Caston Mateo (36) defeated Zanu PFs Cleopas Kundiona in the battle for the Marondera Central seat.